I’ve owned this since I was 13 when a school boy at Abingdon School. I managed to get a term’s free lessons because I ‘looked like a saxophonist’ according to the head of music, Antony Le Fleming. I was very lucky to be taught by Pat Crumley, who was a fine musician. He used to borrow this horn to play with Johnny Dankworth. Alas neither are with us any more. 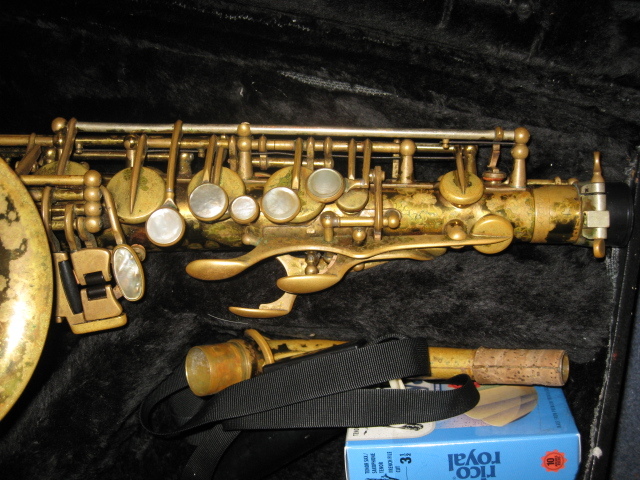 In fact I started playing tenor on a Selmer Pennsylvania the school owned before my mum bought me an Italian Grassi alto. The Mark VI belonged to Dave Blackburn, who sold it to me because he wanted to concentrate on the guitar. My mum bought it and I think I paid her back half of the (comparatively) very small sum these things cost in the early 1970s. So – eternal thanks from me to Pat, Dave and my mum! ‘They’ say that Mark VIs with a serial number around 100k are the best, while I haven’t played many others, my M99804 is certainly the best of the best. 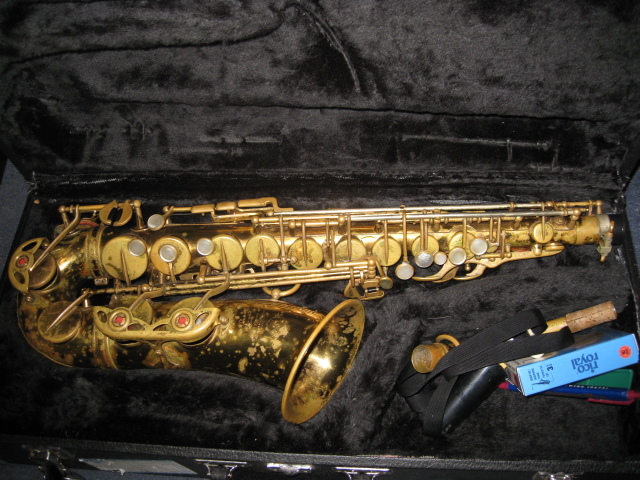 This is the Stradivarius of saxophones! It’s lost a lot of its lacquer (as you can see), but it plays like a dream. 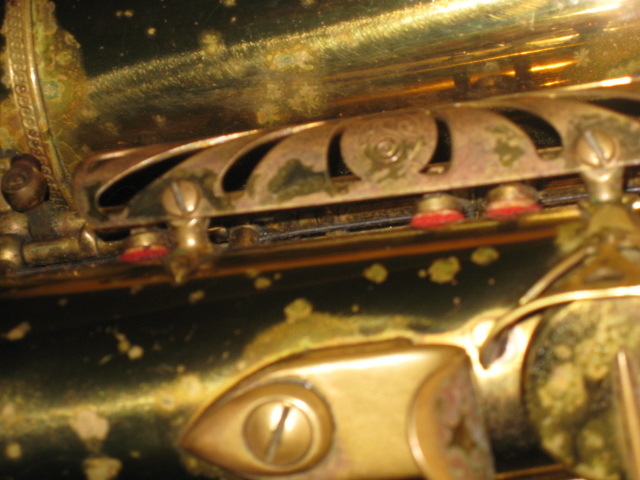 In this clip I’ve used a Bobby Dukoff metal LD 7 mouthpiece with a Rico 3 1/2 reed. 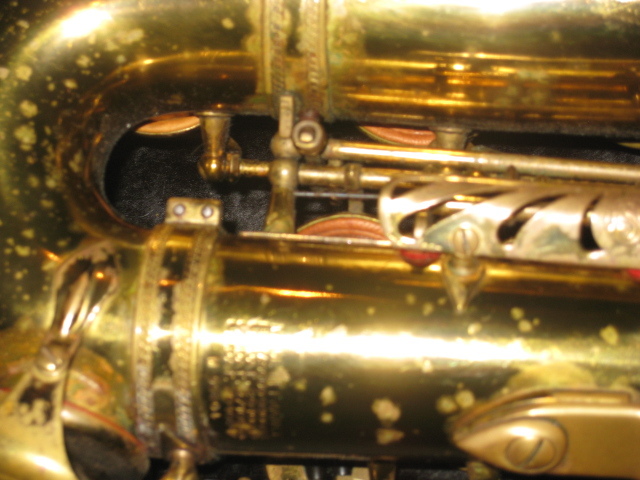 The instrument is so famous that I don’t think I have to give too many details – enough to say mine is a European made and assembled horn – rather than the US ones which were finished with slightly different external features. 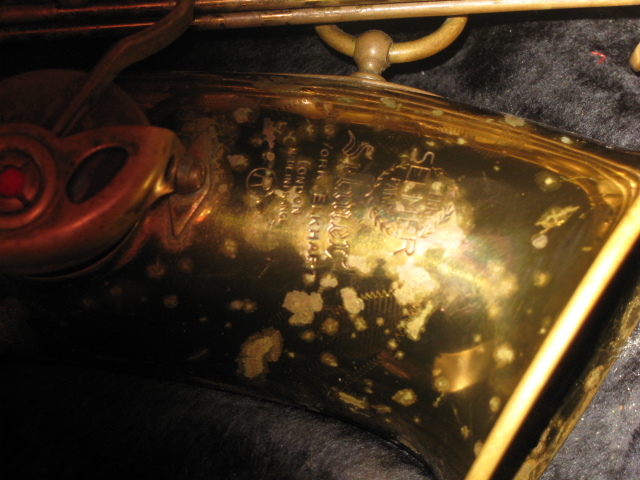 It doesn’t have engraving on the ‘bow’ (the large curved tube between the bell and body), it has no serial number on the neck and never had coloured enamel on the ‘S’ decal on the neck octave mechanism – at least not while I’ve owned it. The plastic left thumb pad is made of black plastic and it does have a high F# key. 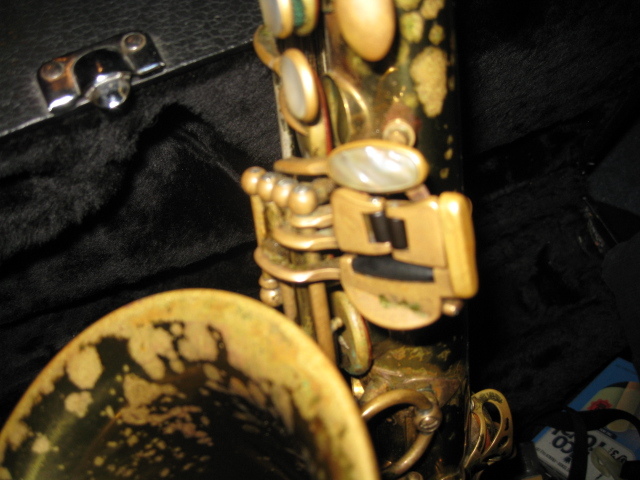 Over the years I’ve had this sax repadded twice – first by Willie Garnet and then by my local fixer-upper. Things have got a lot better since I discovered pad guards (a cloth covered metal stalk that fits inside the instrument when it’s in its case) and I can vouch for the savings you’ll make if you use one (£15 v £200 for an overhaul). I played this from 1976-1981 in the Snakeyspat band (including a couple of times alongside Pat), the TC band (from the late 1990s) and in all of the cabaret bands I’ve been in. 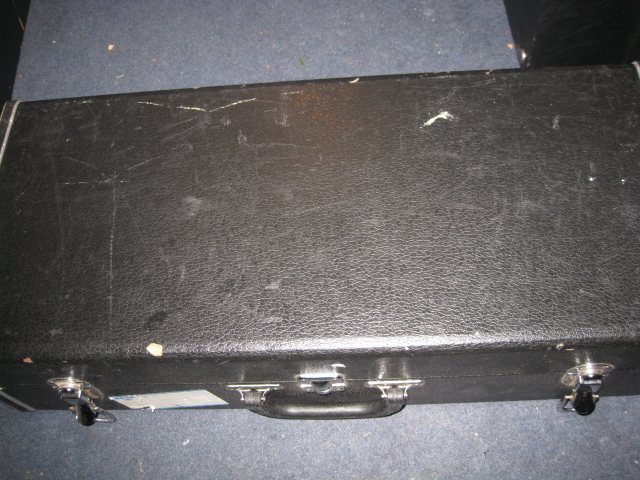 In fact for the first 10 years or so I was only an alto player, only buying a tenor when I got a proper job. It has a sweet, mellow tone, is easy to play through both octaves and enables you to forget about the mechanical issues of playing saxophone. 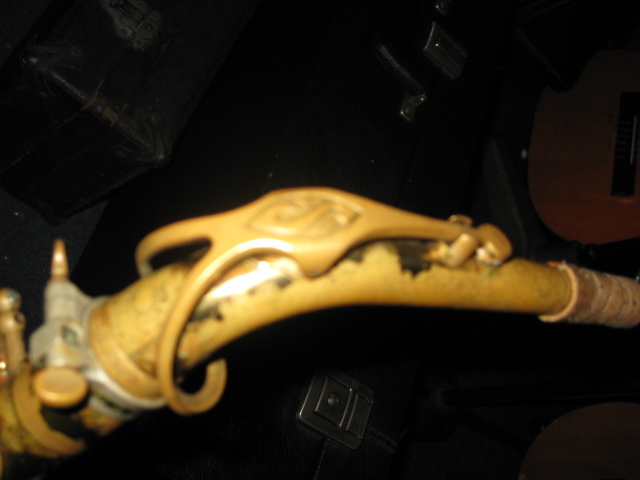 I was once leaving a gig at the Corn Dolly in the centre of Oxford and someone pointed out that I’d left a bit of the sax behind (one of the rods had fallen out, leaving the bottom ‘C’ key on the floor). Luckily it all fitted back together when I got it home. 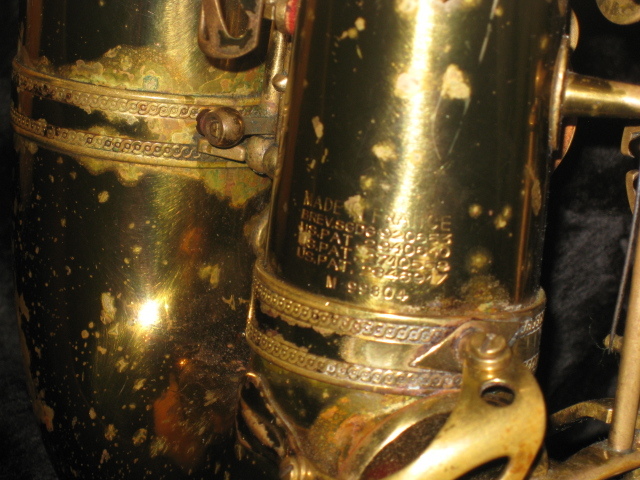 More about Selmer saxophones can be found currently on the Web from saxpics, Wikipedia and many other sources. 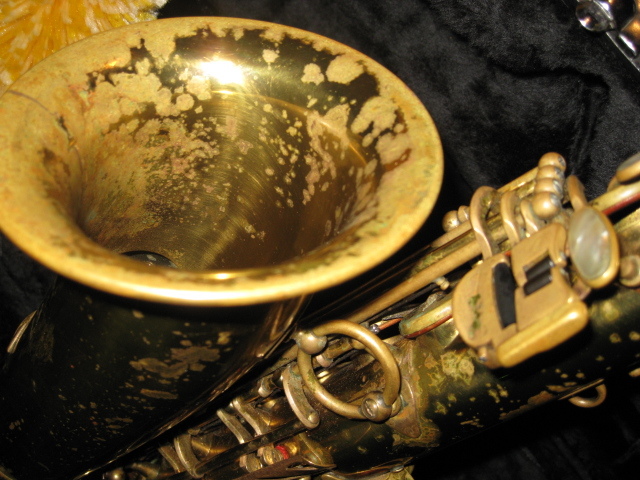 Do you own a Selmer sax? Do later instruments have different qualities?Please let me know by commenting on this post. 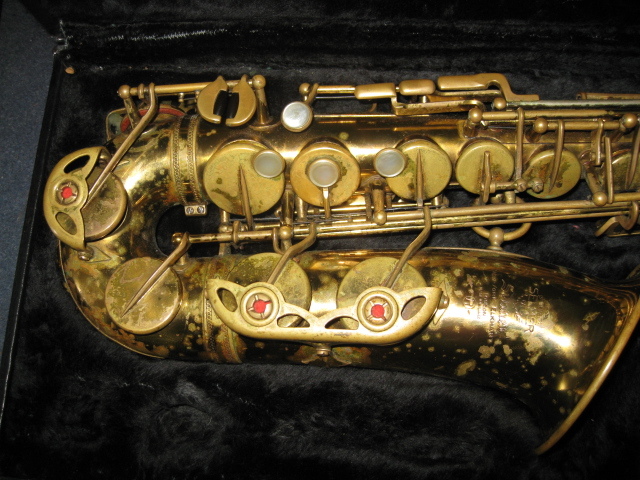 I have one here that was left to me by my father.I haven`t a clue how to play it 🙂 Just doing some research as to it`s value when I came upon your blog.It`s a 1960 model with a 99*** serial number. I was offered £1000 for it by a dealer but as it`s in immaculate condition it would seem to be worth a tad more than that.Have the original receipt into the bargain. Anyone would be more than happy to get a Mark VI for that little. I’d have a look at eBay and see what the current prices are. Hi Martin, Thanks for a great and interesting site! 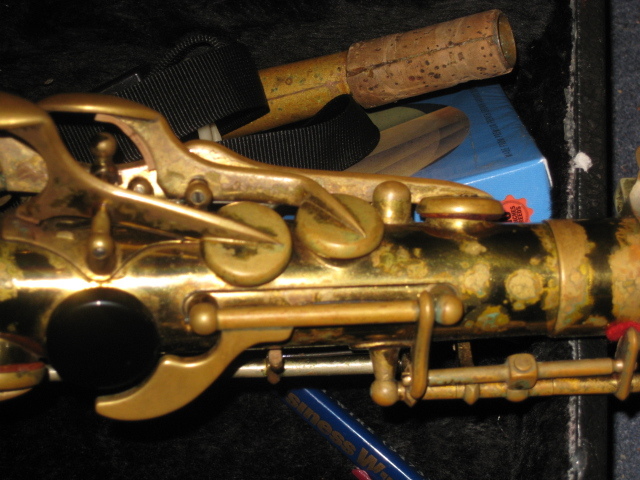 I am writing because I own a Mark 6 alto almost identical to yours – in fact, looking at the photos, the similarity is astonishing: 1962 manufacture, the same deep gold lacquer, the partial wearing-off thereof, lack of enamel blue background on the crook “S” logo, the European engraving on the bell – it is comforting to find another one in the world! I am the third owner, and have had it since about 1995; I got it from a friend, who got it from the original owner, whom I have tried to track down to get more info re. its provenance, but unfortunately it seems he has recently passed away. It would be interesting to discover if Dave Blackburn bought your one from new, and if he had any more info about it e.g. where it was originally bought, overhauls etc. Thanks once again for a really interesting site, all the best!